The BEST WESTERN PLUS Barclay Hotel, the largest full facility hotel in Port Alberni, BC. When staying with us there is no need to give up conveniences you are used to. You can discover treasures to take home at the Alberni Harbour Quay, and then browse our onsite Cold Beer, Wine Store and liquor store or retreat to our Stamps Cafe or Pastimes Sports Bar and Grill to enjoy a snack or to watch the game on our big screen TV. Then, relax in our sauna or pool before settling in our luxurious accommodations to enjoy the vintage wine picked up earlier. That's when you will truly understand why the tranquil setting of our hotel has been called the perfect place to call home. If traveling on business, our Port Alberni Hotel boasts over 4500 square feet of meeting space in four rooms that are perfect for small conventions, banquets, parties, meetings and weddings. AV equipment and catering are also available. A fantastic start to the contest for the Bulldogs, as they spent the first minute of the game on the attack in the Nanaimo zone. The Dogs pushed the pace early, and built up a shots on goal advantage but couldn't find the net to open the scoring. A fantastic save by Carson Schamerhorn on the league's leading scorer in Sheldon Rempal kept it scoreless, before his counterpart in the other net Evan Johnson made a diving highlight reel save of his own on a rebound on a Bulldogs power play chance shortly afterwards. The Clippers went again to the power play shortly afterwards, and moments after a diving defensive play by Will Reilly prevented a shorthanded breakaway the Clippers opened the scoring when Yanni Kaldis made a nice move to make a defender miss before throwing the puck to the slot for Matt Hoover who one-timed it home. Sheldon Rempal also drew an assist on the play at 13:44 on the power play. The period would end on a questionable call, as Corey Renwick drove Tyler Halls from behind into the end boards with no time left on the clock as the period ended. Somehow, the Bulldogs would end up down a man out of the situation. Shots favoured the Bulldogs 15-11 in the period. The Bulldogs would kill off the power play with a solid effort, and kill off another subsequent Nanaimo power play shortly afterwards to keep the deficit at just 1-0. They would finally earn a power play of their own just past the midway point of the game, and they connected on it as Jordan Sandhu and Paul Meyer worked the puck beautifully between each other before Sandhu set up Chris Schutz in the left circle where he blew a one-timer on goal that looked to hit Johnson square but he had enough on it that it just squeaked over the line to make it 1-1 at 11:14 of the second. As it seems to happen so often at the Multiplex, the Dogs would have a treat in store for the Clippers as just 19 seconds later they found the net again to take their first lead of the game when Chris Sarault got the puck in deep behind the Clipper net for Cayden Kraus. He would set up Liam Conrad in the slot where he blasted a one-timer home past the blocker of Johnson to make it 2-1. With the Dogs continuing to push, the Clippers would respond quickly to tie it up on a pretty goal as Sean Buchanan made a Bulldog defender miss with a pretty move before walking into the circle where he snapped one home top corner, short-side on Schamerhorn to tie it at 2-2 at 13:11 with Zach Court and Adam Pilotte drawing the assists. The Dogs would surge ahead again on the power play just a minute and change later on a reverse set up of the previous goal as Chris Schutz worked the puck to the top of the point for Jordan Sandhu, who dished off to Paul Meyer in the right circle where he blasted a one-timer through the legs of Johnson to make it 3-2 at 14:25 of the second for a 3-2 Dogs lead after two. Shots were 9-8 Bulldogs in the period, for a 40 minute advantage of 24-19. The Bulldogs would pad their lead early in the third period, when the Clippers defence coughed the puck up in their own zone after a series of hard hits finished by Eric Margo. The loose puck would be found in the deep slot by Jordan Sandhu, who walked in alone on Johnson where he faked cutting across the crease before tucking it in on his backhand, short-side to make it 4-2, unassisted just 3:03 into the third. There would be no scoring the rest of the way, but there was a bunch of fireworks with late calls, missed calls, and a pretty big dust up at the benches when Eric Margo appeared to be the victim of a vicious head shot, that after the dust settled appeared to go uncalled. The Dogs would protect their lead, and look to have a great chance on an empty net into the Nanaimo zone when Tristan Bukovec appeared to fight off what looked like no less than three sticks around his arms and body into the Nanaimo zone but couldn't draw a call from either ref. The Clippers would just seconds later race up ice and come very close to getting within on a goal on an extended scramble around the Bulldog net that looked like someone had thrown a large pile of Halloween candy on the ice. Schamerhorn would make a couple of saves, and appear to get some help from a diving Chris Schutz to keep the puck out. Final shots favoured the Bulldogs 33-29, with Carson Schamerhorn picking up the win in net while Evan Johnson took the loss. The Dogs went 2 for 6 on the power play while the Clippers went 1 for 6. With the win, the Dogs snap their losing streak at two, while also snapping the Clippers win streak at four. The Dogs next see action Friday night when they host Vernon. After two meetings to open the season at the Frank Crane Arena, it's time for the Bulldogs (5-9-1-1, 4th Island) to play host to the Clippers (11-6-0-0, 1st Island) as the teams face off tonight at the Dog Pound for a little Halloween fun. 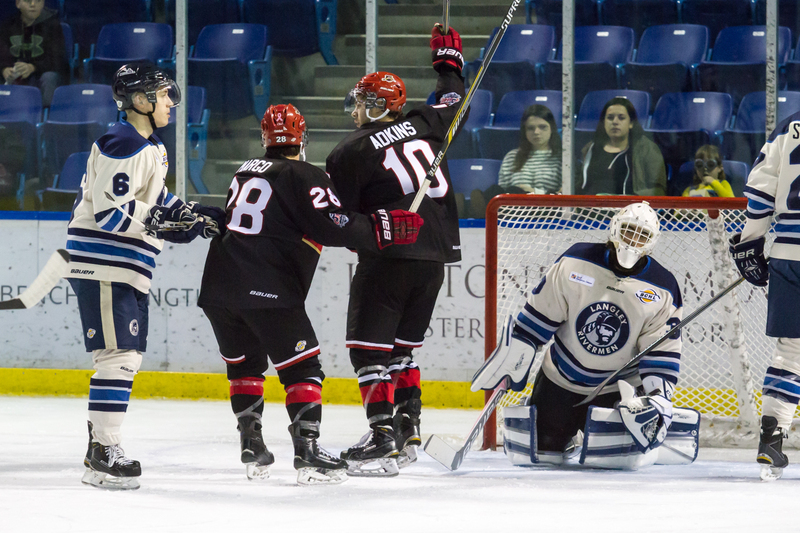 The Clippers won the opener of this home-and-home set last night 3-0 in Nanaimo, on the strength of three goals in the first period. The Bulldogs are trying to give you some incentive to spend Halloween night at the rink - any kids dressed in costume tonight get in free, while any adults in costume get in for the kids rate, so hopefully lots of people will get into the spirit. Just a heads up NO - a "pedestrian" doesn't count as a costume! After the game anyone in costume is encouraged to go out on the ice for a little trick or treating with the Bulldog players. If you aren't a fan of Halloween in any way shape or form, as the Bulldogs said on their twitter account earlier this week - heading to the game is a legit excuse to turn off the lights and not answer the door! Let's hope the Dogs have nothing but tricks in store for the Clippers tonight! We'll have all the action covered from start to finish if you can't make it to the game (or bring your radio with you if you are attending) on 93.3 The Peak FM's Bulldogs Hockey brought to you by Pacific Chevrolet. Everything gets going with our pregame show at 6:45 with the puck drop and play-by-play to follow at 7:00pm. Dan Tisserand will compile team and player stats, Bruce MacDonald will provide colour commentary and analysis and I'll call the play-by-play. Tonight's 2nd Intermission guest is Graham Turnbull, the play-by-play voice of the Vernon Vipers. The Bulldogs next see action at home on Friday when they host the Snakes. The game started about 13 minutes late as it was the Clipper's parents weekend and much like the Bulldogs presentation all the parents were introduced on the ice prior to the game. The action was back and forth in the early minutes with each team appearing ready to play but not much in the way of scoring chances either way. Near the midway point of the period the game got very ugly, as a long series of events up the ice by both teams - hacking, wacking, high-hitting, cross-checking ALL went uncalled by both of the Referees, who chose to just let everything go. There's a fine line between "letting them play" and "losing control" and unfortunately it looked like it was the latter in this case. Especially unfortunately from the Bulldogs side of the puck was that the Clippers went up 1-0 at the tail end of it all with Sheldon Rempal finding some open ice down the right wing before making a Bulldog defender miss before cutting across the crease and dodging a Brody Claeys poke check before showing great patience and lifting it home. Edwin Hooknson drew the only assist on the play at 11:30 of the period. Immediately following the goal, a hard hit knocked Scott Clark down in the Dogs zone. He would take a follow up hit in the back of the head when he was still down on the ice. As play went up ice, Clark threw a hit in the Clippers zone that resulted in him receiving a major penalty for a blow to the head while Will Reilly picked up a minor. After two minutes of four-aside hockey, the Clippers went to a three minute power play. They would score in the early moments of it, as Sheldon Rempal walked into the slot and faked pass before snapping a shot home short-side past the blocker of Claeys. Assisting were Devin Brosseau and Yanni Kaldis at 15:12 of the second. The Dogs did a good job to kill the rest of the penalty, and were close to escaping the period down just two, but the Clippers padded the lead late on a play that looked a good foot offside - not to the Linesman however, as a cross ice pass from the left half boards to the slot was one-timed home by Chris Dodero with just 32 seconds left in the period to make it 3-0. Assists on the play went to Nolan Aibel and Zach Court. Shots were 16-10 Clippers after one. The second period was vastly different, as good, clean hockey was played for the most part. While the Bulldogs had a much better period and generated a good handful of chances around the Nanaimo net, but the Clippers did a good job of tying up sticks as the Dogs were unable to bang a rebound home to get on the board as the period was scoreless. 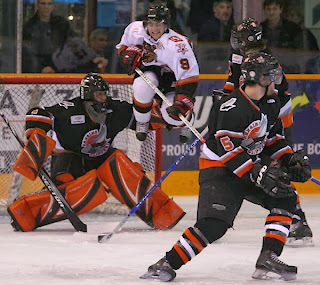 Shots favoured the Bulldogs 12-10, for a two-period total favouring Nanaimo of 26-22. The Bulldogs would earn a power play chance early in the third period, but were unable to capitalize on it to make a game of it. Another power play before the midway point offered another opportunity, but they couldn't find the net before taking a penalty themselves. The Clippers would push hard looking for further insurance, but Brody Claeys made a series of solid saves to keep it 3-0. The Bulldogs would earn another power play later in the third, and would call time out and pull their goalie with 7:38 to play to make it a 6 on 4 situation. While the move certainly increased the Bulldogs' level of desperation it didn't yield any results as they couldn't find the net. The Dogs would again pull Claeys with over two minutes to play in the third, and again showed a good level of desperation but the Clippers defended well and the Dogs couldn't get a bounce or finish a chance as the game ended in a 3-0 final. Shots in the third were even at 11 aside, for a game total of 37-33 favouring the Clippers. Brody Claeys took the loss in net while Jonathan Reinhart picked up 2nd star honours with the win and shut out in net. These teams meet again tomorrow night at the Dog Pound. After five straight games against the Mainland Division, it's back to more familiar opponents tonight as the Bulldogs (5-8-1-1, 4th Island) travel to the Frank Crane Arena to visit the Clippers (10-6-0-0, 2nd Island) to kick off a Friday-Saturday home and home series that travels back to the Dog Pound tomorrow night. The Bulldogs last played Sunday night in Chilliwack, where they fell 3-2 to the Chiefs. The Clippers meanwhile were in action at home against Victoria on Wednesday, where they pulled off an improbable 5-4 win, as they scored twice in the final minute to erase a one-goal deficit to tie the game, and then win the game with 1.2 seconds left on the clock for their third win in a row. It's the second meeting of the season between the teams, and the second in Nanaimo, after the Clippers picked up a 7-4 win over the Dogs at the Frank Crane Arena back on September 30th. One of the lasting memories of that one was that the Clippers went a blazing 4 for 4 on the power play in the contest. 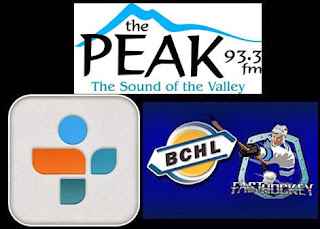 If you aren't making your way to Nanaimo to catch the game, get it all on your radio on Van Isle Ford Bulldogs Hockey on 93.3 The Peak FM with myself, Bruce MacDonald and Dan Tisserand providing the play-by-play, colour and analysis and team and player stats. 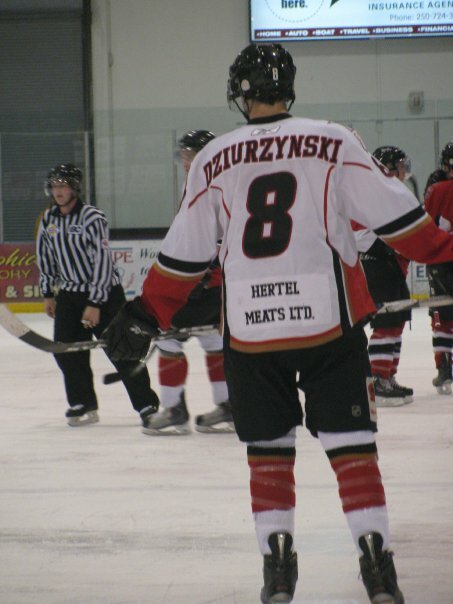 Tonight's 2nd Intermission guest is another Bulldog alum, this time it's David Dziurzynski (2009-2010), who is currently with the Binghamton Senators, the AHL affiliate of the Ottawa Senators. David or "Dizzy" or "the great eight" as I liked to call him, only played one season with the Bulldogs, but it sure was an incredible one. He was third on the team in scoring, and led the team in scoring in the playoffs. When the Dogs season ended, he did the unthinkable - he went straight from Junior A to "the show" when he was signed by the Ottawa Senators. If it wasn't unbelievable enough that a guy was signed by an NHL team straight out of Junior A, the news came out on April Fools Day. People literally couldn't believe it, but it was indeed true. Dizzy played 12 games with the big club in 2012-2013, and scored twice. 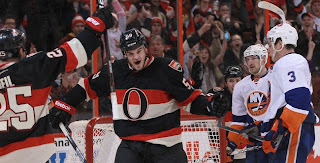 Dizzy signed his third contract with the Sens in July of 2013, a two-year, two-way deal. Here's some media to tide you over until tomorrow night. Nice job by the Chiefs organization to get these highlights put together! While they have the same infrastructure in Langley, or perhaps even better, they sadly don't include the visiting team in their highlights package. They unfortunately didn't include the second goal for Chris Schutz, so here it is! Now THIS is a save! Wowzers! The start was fast-paced with great flow and only a couple whistles through the first five minutes. While the Dogs had an early 3-0 lead in shots, they took a penalty just under six minutes into the game. They would do a very good job to kill it and keep the Chiefs off the board, but shortly afterwards it was 1-0 when a pass behind the goal by Connor McCarthy was put to the top of the crease by Kohen Olischefski right onto the tape of Linden Hora. He would have too much time and space, as he knocked the puck down and roofed it under the bar, glove-side on Brody Claeys at 10:09 of the first. The Dogs earned a power play almost immediately after the goal, but failed to connect on it. Through the late minutes of the period the Chiefs would start to carry the better of the play and got a good amount of pucks on Brody Claeys, but he held the fort to keep it 1-0 Chiefs after one, with shots favouring Chilliwack 14-8. The second period saw the Chiefs continue to carry the better of the play, while the Dogs were for the most part defending through the first 10 minutes. They would come up with a big penalty kill when all four players were stuck on the ice for the full two minutes, as Brody Claeys came up with a handful of big saves on wide open looks to keep his team within one. The Dogs would get going throughout the back half of the period and generated a couple good chances around the Chiefs net, most notably a breakaway for the hashmarks and in for Cayden Kraus. He would put a nice move on before lifting a backhand on goal that Matteo Esposito made a good save on to keep it 1-0. 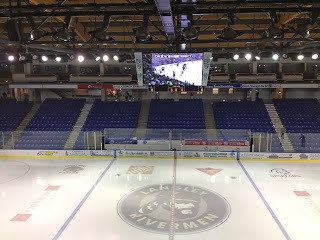 The Dogs would take another penalty late in the period, and the Chiefs would make them pay when they connected with just half a minute to go in the advantage when Olivier Arseneau blew a slap shot on net from the left point that had eyes, and might have changed direction of a Bulldog defender before it went in top corner, far-side over the glove of Claeys at 19:10 of the period with Mark Esposito and Jordan Kawaguchi assisting. Shots favoured the Chiefs in the period 16-7 for a two period advantage of 30-15. The Bulldogs had a fantastic chance just seconds off the third period puck drop, as they raced in on a 2 on 1 rush that saw Nathan Dingmann set up Josh Adkins with a cross-ice pass. He would put a shot on net, but Esposito came across and made a highlight reel glove save. Just a minute later an incident broke out that made me pretty hot, as Eric Margo and Kale Kane dropped the gloves to fight. One Linesman would for some reason immediately jump in, and grab both of Margo's arms, resulting in Kane being able to get off three cheap sucker punches with Margo unable to defend himself. Somehow, Margo would get four minutes and Kane would get two. The puzzling call saw insult turn to injury just seconds later, as the Chiefs connected on the power play when Jordan Kawaguchi dished the puck to the slot for Mark Esposito. He in turn set up Vimal Sukamaran in the left circle with a cross-ice pass, that he one-timed home short-side past Claeys to make it 3-0 at the 4:31 mark of the third. The score stayed that way until the late stages of the game, when the Dogs showed no quit and saw some of the calls start to go their way. After a big Brody Claeys breakaway glove save on a breakaway chance for Kohen Olischefski the Dogs would earn a power play, and while struggling early in the advantage they connected on it late as Paul Meyer found Chris Schutz in the left circle where he snapped a wrist shot passed a screened Esposito to make it 3-1 at 14:47 of the third. 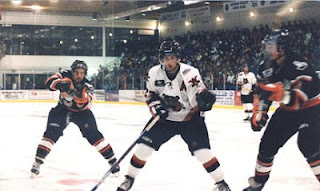 The Dogs would earn another power play just minutes later, and once again scored on a play similar to the first as Clark fed Meyer at the top of the point, where he faked a shot and put a perfect feed onto the tape of Chris Schutz at the top of the left circle where he blew a one-timer home past Esposito to make it 3-2 at 17:35 of the third. That's as close as the Dogs would come however, as they couldn't generate a great scoring chance to try for the equalizer as the Chiefs made the lead stand. Final shots favoured Chilliwack 35-23, with Matteo Esposito picking up the win while Brody Claeys took the loss. Both teams went 2 for 4 on the power play. The Bulldogs next see action Friday night in Nanaimo when they kick off a home and home set with the Clippers that concludes Saturday night at the Dog Pound. The Bulldogs are unbeaten in two on this road trip, following up a 3-3 tie in Wenatchee on Friday night with a 4-1 win over the Rivermen last night in Langley. 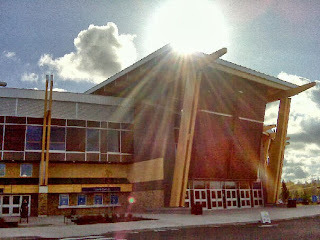 The Chiefs were in Surrey Friday night, where they won their second in a row, 4-0 over the Eagles ... They also saw action earlier this week at home where they beat Wenatchee 4-1 on Wednesday night. These teams met just six days ago at the Multiplex, with the Chiefs playing a solid road game to pick up a 4-2 win. 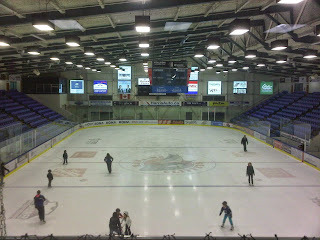 I'll bring all the action to you on your radio or computer or smart phone on Van Isle Ford Bulldogs Hockey on 93.3 The Peak FM, starting with the pregame show at 4:45 with the puck drop and play-by-play to follow at 5:00pm from the lovely vantage point in the Prospera Centre broadcast booth as seen below. Tonight's 2nd Intermission guest is former Bulldog (2005-2007) Harry Zolnierczyk who is currently with the AHL's San Deigo Gulls after signing with the Anaheim Ducks this summer after spending last year in the New York Islanders system. Harry has played 59 games in the NHL, and has had some memorable moments - he scored in his first NHL game with the Philadelphia Flyers, and he was with the Flyers through the HBO 24/7 season, playing the 2012 Winter Classic outdoor game in Philly in front of 49,000 fans where he picked up without question the "crunch of the game" on the Rangers Artem Anisimov. After being traded by the Flyers to the Anaheim Ducks, he was subsequently traded to the Pittsburgh Penguins, where he got to play with some Crosby guy. A solid start for the Bulldogs, as they drew a penalty and took a 1-0 lead before the game was four minutes old when Garrett Halls threw a puck off the net from the left point in a perfect set up onto the tape of Josh Adkins who tipped it home past Bo Didur. Quinn Syrydiuk also drew an assist on the play at 3:53 of the first. The Dogs would kill off a Rivermen power play chance late in the period and looked to possibly take a 1-0 lead to the room, but the Rivermen would draw even before the period was out on the Rush as Schamerhorn made the first save off his mask, but couldn't locate the rebound before Matthew Graham found it in the slot and fired it home high glove side to make it 1-1 at 18:01 of the first. Shots in the period were 12-8 Langley. The Bulldogs began the second period with a carry-over power play of just over a minute in lenght, but weren't able to capitalize on it. The score would stay tied at 1-1 through the first half of the frame, with each team having their chances but the Bulldogs appearing to have the better of the play. In the latter stages of the period Carson Schamerhorn would make a good save on a one-timer set up to the deep slot. That would prove huge as the sequence ended with Scott Clark firing a head man pass up the right wing for Josh Adkins who attacked the net with speed before firing a wrist shot short-side on Didur. It didn't go straight in, as Didur got a good chunk of it, but it squeaked over the line just enough to make it 2-1 at 14:07 of the second, with Tyler Cooper also drawing an assist on the play. The Dogs would take the lead to the room after two, and a 23-17 edge in shots after outshooting the Rivermen 15-5 in the period. The third period saw the Bulldogs have a great chance early on a 2 on 1 rush, where Josh Adkins kept the puck and fired low on net. Didur would make the save, and appear to get some help from the crossbar at Adkins' attempt on his own rebound somehow stayed out. The Dogs continued to control the bulk of the play, and after a series of big stops by Didur to keep the Rivermen in it the Dogs went up 3-1 on the power play with 10:30 to play as Marshall Skapski made a good play to keep the puck in at the line and find Nathan Dingmann at the right point. He in turn found Josh Adkins in the left circle, where he snapped a shot on goal that was blocked in front. It came right back to him though, and he was rewarded for his shoot-first mentality as he just pounded the puck at the net again and beat Didur short-side low before he could find the puck to make it 3-1 at 9:31 of the third. The Bulldogs wouldn't take their foot off the gas despite the two goal cushion, and Langley never got anything going as the Dogs carried the play until they sealed it into the empty net with 20 seconds to go as Liam Conrad found and Eric Margo clearing attempt after a Garrett Halls rim up the boards and sealed the deal from the Langley line for the 4-1 final score. Shots favoured the Bulldogs 40-18, as they out shot the Rivermen 17-1 in the third period. Carson Schamerhorn picked up third star honours with the win in net, while Bo Didur took second star honours with the loss. The Dogs went 2 for 4 on the power play, while the Rivermen went 0 for 4. The Dogs conclude their trip tomorrow night at 5pm when they visit the Chiefs in Chilliwack. It's the first meeting of the season between the teams as the Bulldogs (4-7-1-1, 4th Island) are back in Canada tonight to visit the Rivermen (9-5-0-0, 3rd Mainland) for a 6pm start time at the Langley Events Centre. The Bulldogs got back into Canada just before 4am today, travelling back from Wenatchee where they tied the Wild last night 3-3. Catch every second of the action on 93.3 The Peak FM's Bulldogs Hockey brought to you by Van Isle Ford with the pregame show taking to the air at 5:45 with the puck drop and play-by-play to follow at 6:00. Tonight's 2nd Intermission feature is an interview from last week, when BCHL Commissioner John Grisdale was on the BCHL Report on Team 1040 in Vancouver, speaking about the leagues recently launched initiative and partnership with the Canadian Mental Health Association called "Talk Today" along with comments about the Wenatchee Wild joining the league and some of the BCHL's top prospects. 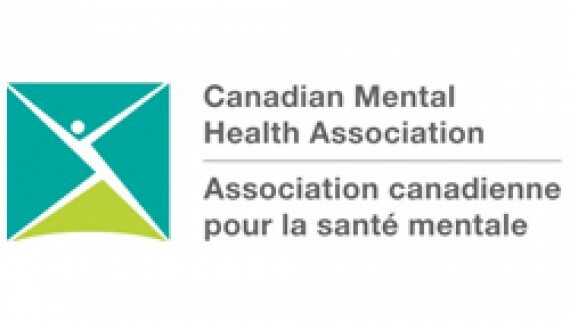 Vancouver, British Columbia—Canadian Mental Health Association’s (CMHA) BC Division and the BC Hockey League (BCHL) today announced a new partnership and launch of an initiative called Talk Today. Talk Today is a mental health education program designed for BCHL players and their supporters to learn about mental health and increase their skills in order to help support players who may be struggling or at risk of suicide. “We are excited to partner with the BC Hockey League, to help their athletes connect with the mental health supports and resources they need to thrive,” says Bev Gutray, CEO of CMHA BC. The Talk Today program is one of the most comprehensive mental health programs for amateur sports in Canada. It consists of several components including mental health and suicide awareness workshops, 1-1 mental health coaches, and Talk Today community awareness events at BCHL games. The announcement comes as welcome news to athletes like 16-year-old rising hockey star Myles Mattila. Based in Kelowna, Mattila has been a mental health advocate for several years as a result of the impact of two events: when he didn’t know how to help one of his hockey teammates who was experiencing mental health issues, and the passing of former Vancouver Canucks’ player, Rick Rypien. At the heart of Talk Today is the relationship between BCHL teams and CMHA branches. For each of the 17 BCHL teams, a local CMHA Mental Health Navigator will serve as a liaison and will help provide referrals to community mental health and addictions support. The Navigator will also work closely with their local BCHL team to help promote mental health awareness within their local community. Talk Today builds on the success of an initiative of the same name launched in Ontario in 2014 as a partnership between CMHA Ontario and the Ontario Hockey League. 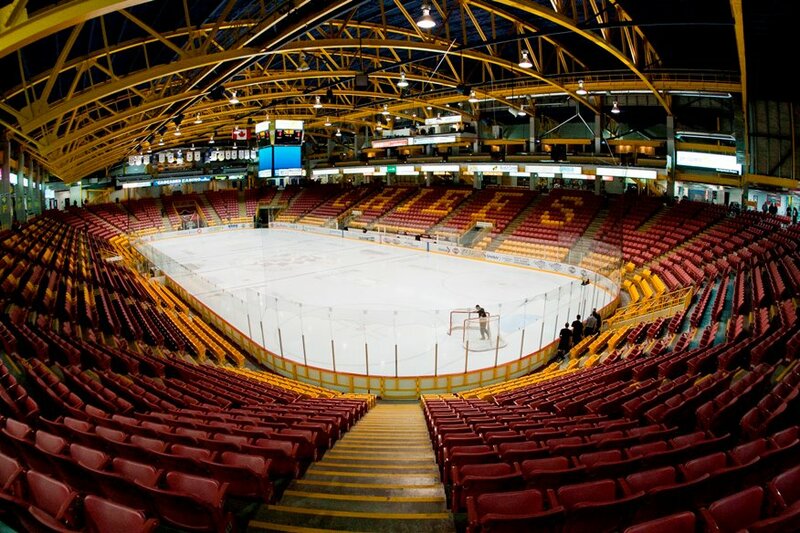 Find your local BCHL team and watch for more on Talk Today awareness events coming in early 2016 at www.bchl.ca. To learn more about Talk Today, visit www.cmha.bc.ca or join the conversation on social media using #talktoday. 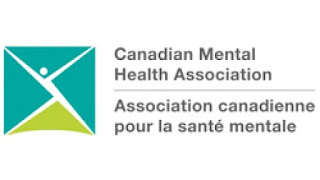 As the nation-wide leader and champion for mental health, the Canadian Mental Health Association (CMHA) helps people access the community resources they need to build resilience and support recovery from mental illness or addiction. Each year, CMHA BC together with a network of 14 BC branches provides services and supports to over 140,000 British Columbians. To learn more visit www.cmha.bc.ca. The game started about 15 minutes late after plenty of pomp and circumstance. While this sometimes has a negative effect one on side or the other, that didn't seem to be the case with both sides playing with pretty good pace early and looking sharp. The Wild would have the edge in shots and chances in the first, out-shooting the Dogs 12-3, with Carson Schamerhorn looking sharp in the Dogs net. At the same time the Bulldogs were guilty on two separate instances of turning something into nothing as they skated in on odd-man rushes that were very promising scoring chances. They would end up in nothing as on both instances a pass attempt failed to connect with the intended recipient. The Wild would throw a couple of hits late in the period that got the crowd going, but I really liked the Bulldogs response as they pushed back and hit back in a big way. Shots favoured the Wild 12-3 after 20 minutes. The second period saw plenty of fireworks early. The Bulldogs would begin the frame on the power play, but failed to threaten. It was instead the Wild who had a shorthanded breakaway, but Carson Schamerhorn came up with a big save off August Von Ungern to keep it 0-0. Just a few minutes later, it appeared that the Wild had seven men at the very least on the ice. The whistle would sound, but it was the Dogs who ended up penalized, and not Wenatchee. They would make quick work of the power play, on a simple shot and a rebound from the top of the point through traffic. Schamerhorn would make the first save on Bryon Yoon, but Kyle Stephan would tap the rebound into the open side to make it 1-0. Yoon actually didn't get an assist on the play, with the only one credited to Mike Coyne at 5:15 of the second. The Bulldogs would answer back to tie the game at 1-1 less than two minutes later, as Garrett Halls made a good defensive play in the Dogs end, throwing a hit and kicking the puck up the right wing for Nathan Dingmann, who used great speed to drive wide up the wing before cutting in on goal where he lifted it up and over Chase Perry short-side. Tyler Cooper would be credited with the only assist at 6:45 of the second. Just over a minute later the Dogs would end up in big penalty trouble, with the Wild going to a 5 on 3 power play for 1:30 in duration. The Bulldogs would bend but not break, killing both penalties off. Carson Schamerhorn made without question the save of the season to preserve the tie as he went post to post and dove through mid-air to make a glove save on Kyle Stephan to rob him of what looked like a sure goal on a wide open net. The Bulldogs were again sent to the box later in the period, and the Wild would again connect on it as a wrist shot from the top of the point by Bryon Yoon appeared to hit a Bulldog defender and bounce up and over Schamerhorn to make it 2-1 at 15:19 of the second with Mike Coyne and Logan Milliken assisting. Shots favoured the Bulldogs in the period 14-12, for a two period total in favour of the Wild 24-17. The third period would see the Wild again get an early power play chance, but the Bulldogs did a good job to kill it off to keep it a one-goal game. The Bulldogs would push through the middle stages of the period and had a handful of prime scoring opportunities, most notably on two Chris Schutz chances in the slot that Chase Perry came up big on. The Dogs would earn a power play chance of their own late in regulation, and would connect on it as Paul Meyer found Scott Clark on the right wing where he snapped a shot on goal that was tipped home five-hole by Nathan Dingmann to make it 2-2 with 3:46 to play in the third. The Dogs kept pressing, and seconds after a fantastic Chase Perry glove save on Jordan Sandhu on the doorstep, it was 3-2 Dogs when Sandhu won the draw to Nathan Dingmann, who fed Tyler Cooper at the right point. He would fire a quick shot on goal that hit something and went through the legs of Perry with 1:44 to play in the third. They couldn't hold the lead though, as the Wild pushed right back and tied the game with 1:04 to play when August Von Ungern slid a loose puck home from the slot through a maze of bodies. Aaron Murray and Blake Christensen drew the assists at 18:56 of the third. The shots would be even at 31 aside through regulation time, with the Dogs out shooting the Wild 14-7 in the third. There would be no scoring through overtime, with the Dogs having the better of the chances in the first frame, and the Wild having the better of the chances late in the second OT with Carson Schamerhorn standing tall to preserve the tie. Final shots favoured the Wild 36-34. The Dogs went 1 for 4 on the power play while the Wild went 2 for 6. The Dogs are on their way back to Canada as we speak, they face the Rivermen tomorrow at 6pm in Langley.